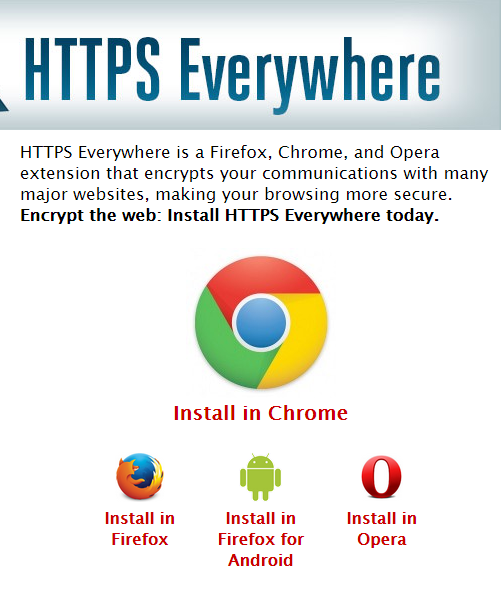 With HTTPSEverywhere your browser connects to a website safely with encryption whenever possible, to make communication with the site more secure. It is open source, but plugins of browsers have access to all the data of the visited websites. 1. Click on Install a https://www.eff.org/https-everywhere. 2. Using a secure connection is especially important if you provide personal, sensitive data or password on the site. To make sure that your connection is encrypted look for the lock icon and the https sign in the address bar.